Loving and much loved wife of Bernard (dec), mum of Jenny and Joe, Brendan (dec) and Jenny, Murray and Elaine, Anne-Marie and Phil. 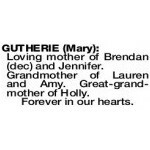 Grandmother of Lauren, Amy, Shannon, Alexandria, Dane and Katherine. Great grandmother of Holly. Passed away peacefully on 31.03.2019. A full life lived for her family. Thank you for your love and support. We will always love you. 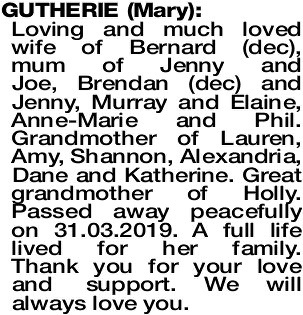 The Funeral Mass for Mrs Mary Gutherie of Como will be celebrated in All Saints Catholic Church Liwara Pl and Orkney Rd Greenwood commencing at 10:30AM on THURSDAY (11.4.2019). The Cortege will leave the Church at the conclusion of Mass and arrive at the Main Entrance of PINNAROO Valley Memorial Park, Whitfords Ave, Padbury at 12:00pm for a Cremation Service. Loving mother of Brendan (dec) and Jennifer. Grandmother of Lauren and Amy. Great-grand- mother of Holly.